I know bean stew feels more like a fall dish rather than a middle of the summer one but, really, is there ever a bad time to enjoy bacon? I have been on a real bacon kick lately and this recipe got the bacon treatment. The original recipe called for chorizo and no bacon. So, I swapped out the chorizo for healthier chicken sausage to justify balance the addition of some crispy smokey bacon. I kept the spinach for good measure. 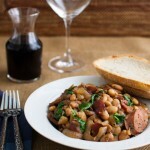 By using pre-cooked sausage and canned beans, this meals comes together in less than 3o minutes. The bacon ensures it is full of flavor. In a cast iron skillet, cook diced bacon over medium high heat. When bacon is almost cooked through, add sausage and cook until sausage is warmed through and bacon is nicely browned. Transfer sausage and bacon to a plate. Drain off all but 2 teaspoons of bacon grease from pan. If you do not have enough bacon grease or prefer a lighter dish, substitute in olive oil. Reduce heat to medium. Add onion and cook until onions begin to soften and get brown, 5-8 minutes. Stir in garlic and thyme. Cook until onions are soft. Add beans and broth and cook, until all the liquid is absorbed, 8-10 minutes, scraping up any browned bits from the pan. Season with salt and pepper. Add spinach by handfuls and cook just until wilted, about 2 minutes. Stir in sausage and bacon mixture. Sprinkle with paprika and serve with crusty bread. Recipe adapted from Bon Appétit, February 2013. Thank you. You are so right about this meal being delicious all year round. It’s 83 degrees here in Los Angeles (feels like 90 degrees) and this dish looked so good I couldn’t wait for cooler weather to make it. -And it is delicious!! That’s awesome. So glad you liked it!